With Christmas and New Year's Eve around the corner, the anticipation for celebrations is in high spirits. In fact, be it New Year's Eve, bachelor/bachelorette parties, graduation parties, etc., everybody parties once in a while. It disturbs the inertia of our routine life and refreshes us before we get back to the daily grind. We Indians thoroughly enjoy partying and do it with absolute grandeur. Therefore, our country is spread with places that are known for parties and these destinations also happen to be fantastic vacation spots. So think no more and book your tickets to these 10 amazing places in India where you can have a blast. The first destination that comes to our mind when we think of parties-Goa. This state in India has been the most famous party place from decades and has been popularised for their parties even in various TV shows and movies. With beaches, like Baga, Candolim, Calangute, etc., that are lined with restaurants, dance clubs and more, Goa is without a doubt the best place to party at in India for every occasion. Havelock is the largest island among the group of Andaman and Nicobar Islands and is also the best island to go to if you're in the mood to party. Especially during New Year's Eve or Christmas, Havelock Island, which remains tranquil otherwise, turns into a party hub that you do not want to miss! While you're here, visit popular places like Ross Island, Cellular Jail, Corbyn's Cove, to name a few. Mumbai, the City of Dreams, has the best of everything. Not mentioning Mumbai in the list of best places to party at is almost sinful! The city has one of the best nightlifes with people of all ages having fun, especially during weekends. Don't miss out on popular places of Mumbai, like the Gateway of India, Marine Drive, Juhu Beach and Elephanta Caves, if you're travelling to this beautiful city of India. Experience Manali's stunning vistas of lush greenery, lofty mountains and mesmerising snowfall during winter while partying at this hill station. Parties at Manali are one of a kind, since many are psychedelic trance parties that can be enjoyed thoroughly when coupled with the stunning vistas of the hill station. Try paragliding or biking through the Rohtang Pass if you're looking for adventure. Visit Solang Valley, Hadimba Temple, etc. on your visit to Manali. The increasing IT crowd in Bangalore has given rise to numerous clubs, pubs and restaurants on the streets of the city. This Silicon Valley of India will definitely give you one of the best partying experience of your life. Stroll through MG Road and Commercial Street for shopping while you're here and visit the gardens galore, such as Cubbon Park, Lalbagh, etc. Diu is a town that is nestled on the Diu Island and is popular for an old Portuguese Cathedral and Fort Diu. With beaches, like Ghogla and Nagoa, lining the town, Diu has a good nightlife with exciting parties. Enhance your visit to Diu by visiting places like St. Paul Church, Naida Caves, Zampa Gateway, to name a few. Gokarna, the temple town nestled on the border of Karnataka, has recently attracted many foreign tourists since they saw tourist potential in its untouched, pristine beaches. Ever since its tourist attraction as a beach destination went up, Gokarna has been the place for partying to many youngsters. Try beach-hopping at Gokarna by visiting Paradise Beach, Om Beach, Gokarna Beach, etc. or indulge in water sports like banana boating, kayaking or just swimming. PC: OML Entertainment Pvt. Ltd.
Pune has become a hub of youngsters due to the growing number of educational institutions that crowd the city, which gave it the nickname Oxford of the East. 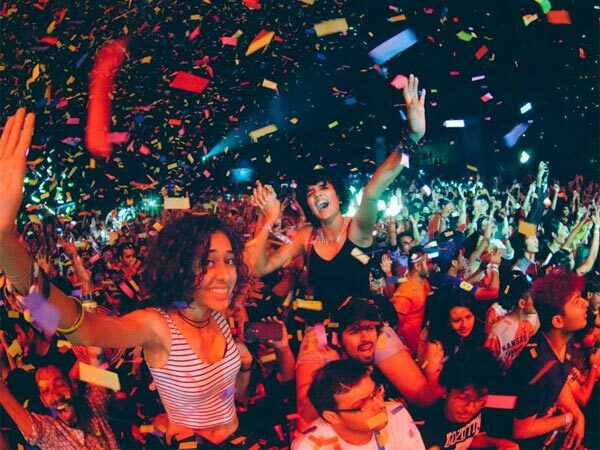 Due to this, Pune has now become a brilliant party destination that will surely not leave you unhappy. Some of the places you must visit at Pune include Shaniwar Wada, Aga Khan Palace, Bund Garden, Mulshi lake and dam to name a few. Chalal is an offbeat and quaint village of Himachal Pradesh that is located a few kilometres from Kasol. This secluded village is known for attracting hippies from all over the world, due to which it has some of the best trance or psychedelic parties in India. Enjoy the breathtaking views of lush greenery that spreads across the village that is dotted with small streams and surrounded by majestic mountain ranges while you're at Chalal. Known as the Rock Capital of India, Shillong hosts some of the best music festivals that take place in India. These festivals usually host fine music from across the world which is enjoyed with the fine local cuisine, rice beer and more. Party at these music festivals and go to Shillong's popular places of interest, such as the mesmerising Umiam Lake, Elephant Falls, Ward's Lake, etc. The city known for its cute French colonies and a rich French heritage, Pondicherry is a good place for those whose idea of partying is to lay back and enjoy their time with a glass of wine while spending time in Pondicherry's fine restaurants. Revel in the heritage of the French colony, relax on Paradise Beach, experience spirituality in Auroville Ashram and more at Pondicherry.